The twist of this competition is that the ending will be written for the writers and they’ll have to build a plot based on this ending. How the story ends is that the person the main character spends the story interacting with turns out to be a person of her/his imagination. The ending of the story will be written by Alwid lootah. This will be a short story competition with a maximum of 1500 words. The ages of the participants should be between 15-20 targeting young adult readers. 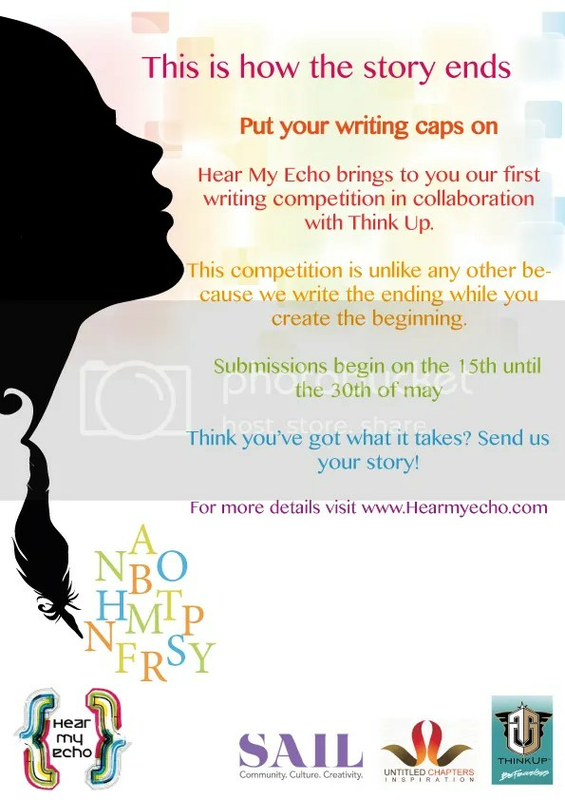 A board of members of Hear My Echo, which are all young writers, will then choose the winner. There will be one 1st place winner and two runner-ups. The two runner-ups will only be published on Hear My Echo website. I stood there unable to move, the truth was right in front of me all along but my imagination ran way beyond my wildest dreams. (He/she) who helped me through, (He/she) who got me so high up in the sky that no matter how far I fell I’ll still land among the stars, and (he/she) who made me believe in what I once thought was impossible is just another character I made up. Did I loose my mind, or did life made me fall so hard I could no longer differentiate between what is real and what is nothing but a character of my imagination? Someone created by the chain of words that run through my mind and someone whose picture I drew based on the features admired the most. How can it be unreal when it made me feel alive? How can it be nothing when it felt like everything?